I was hoping to tell you that I’d bought a house today. A cute 1930s Victorian farmhouse with tall ceilings and lots of big windows. It was a blank slate on the inside, so I could have made it exactly how I wanted it to be. It was going to be the Cookie and Kate studio! I was going to have a beautiful, functional kitchen for the first time in my life! I was going to grow a garden in the side yard! Of course, I got carried away and decorated it all before it was officially mine. Then, the owner took it off the market, for reasons that I won’t bore you with, so it is not mine. I’ll just keep living in this rent house, with its low ceilings, dingy kitchen and beige bedroom walls… which now seem even lower, darker, and more like stained cargo khaki shorts. First world problems. On the upside, I have strawberry shortcake to share today! The idea came to me after I nailed one of the baked goods for the cookbook, which I am so excited to share with you next spring. I had to figure out how to make strawberry shortcake before summer ended. Here it is. This one tastes like classic strawberry shortcake, but it is made with whole grains and it’s naturally sweetened, too. I used coconut milk instead of heavy cream, and there’s no butter required in the shortcake, so it’s easily made vegan. The only trick with coconut milk is that you really must use regular (as in, not light) coconut milk for the recipe to work well, and you’ll need to chill one can (not both) in the fridge overnight. Or hey, use regular whipped cream instead. Either way, while this recipe is more wholesome and nutritionally redeeming than standard strawberry shortcake, it is not a low fat recipe. At the risk of sounding paranoid, a couple health-related notes about ingredients—please buy organic strawberries, as conventionally grown strawberries are the fruit with the highest pesticide content. Also, please buy coconut milk that comes in BPA-free cans (like the Native Forest brand and Trader Joe’s). The high fat content of coconut milk draws the BPA out of the liners, even more so than acidic tomatoes do. I was shocked when I learned that recently. 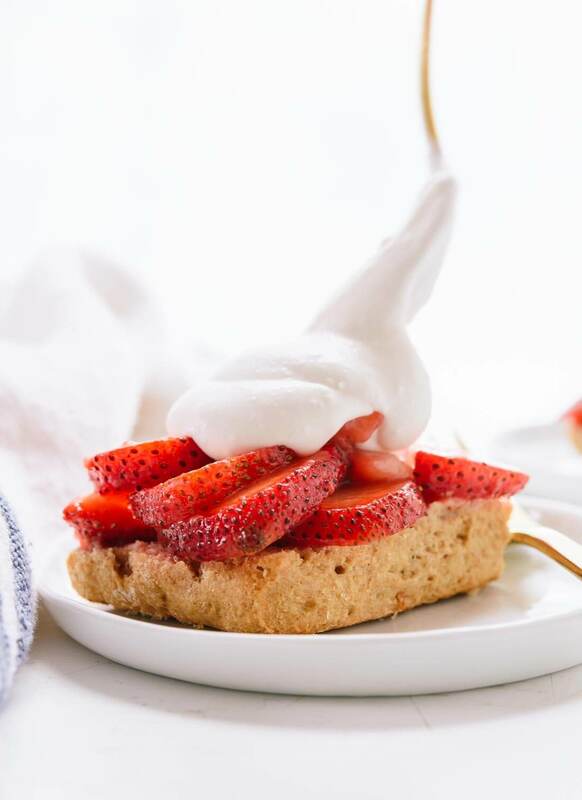 Classic strawberry shortcake made healthier—this recipe is made with honey or maple syrup, whole grains and coconut milk. So delicious! It’s vegan if you use maple syrup instead of honey. 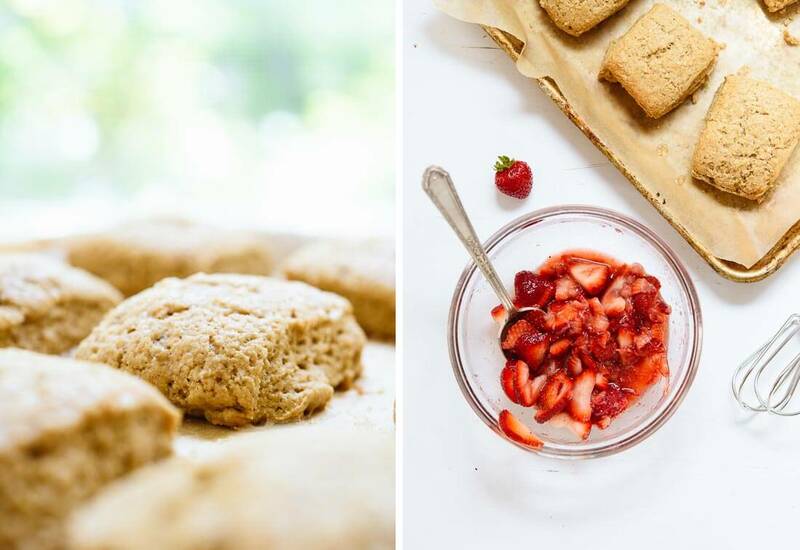 Recipe yields 9 servings (so quite a bit—if you’re serving just 4 people, I’d probably prepare just 1 pound of strawberries, and enjoy leftover shortcakes as though they are sweet biscuits). Preheat the oven to 350 degrees Fahrenheit. Line a large, rimmed baking sheet with parchment paper and set it aside. 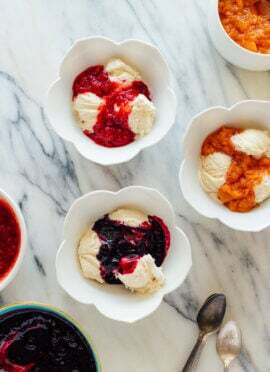 Place a medium-sized glass or metal mixing bowl in the freezer to chill for the whipped cream. To prepare the shortcake: In a medium mixing bowl, combine the flour, baking powder, salt and cinnamon. Stir to combine. 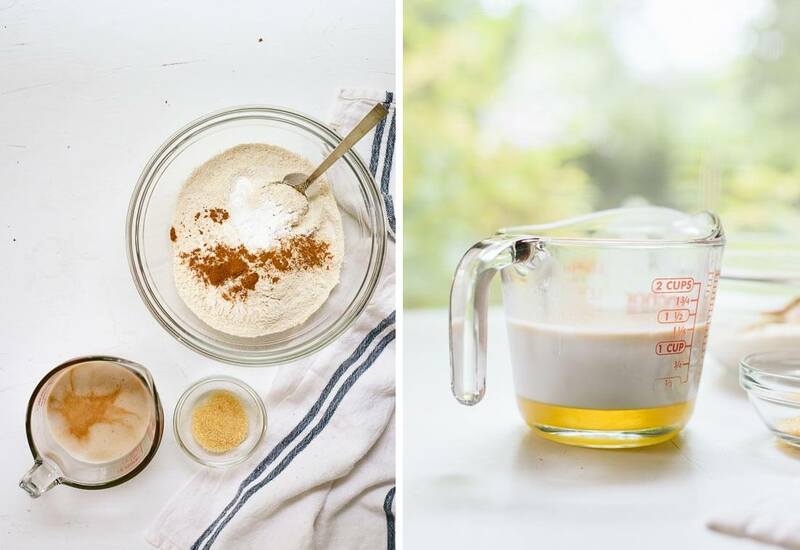 In a 2-cup liquid measuring cup or smaller mixing bowl, combine the coconut milk, honey and vanilla. Whisk to blend, then pour the wet mixture in to the dry. Mix with a big spoon until you have a cohesive dough. If the dough is sticky and unmanageable, let it rest for a few minutes—if it’s still being difficult, add another tablespoon of flour and stir just until incorporated. Lightly flour your work surface, and turn the dough over onto it. Knead the dough a few times, just enough to bring the dough together. Then, press the dough into a square shape about 1″ deep. Use a sharp chef’s knife to slice the dough into 3 even columns and 3 even rows, to make 9 squares. Place the squares onto your prepared baking sheet, leaving a couple inches around each one. Brush the tops of the dough liberally with coconut milk, and sprinkle them with turbinado sugar, if using. Bake for 20 to 22 minutes, until they are firm to the touch. Meanwhile, prepare the coconut whipped cream: Open the can of chilled coconut milk or coconut cream, and scoop the solid white portion into your chilled bowl, leaving the watery part behind. With an electric hand mixer, beat until smooth and relatively fluffy. Add the honey and vanilla extract and blend to combine. Refrigerate until you’re ready to serve. To prepare the strawberries: Place half of the sliced strawberries in a medium mixing bowl and mash them with a potato masher (or pastry cutter or big fork) until juicy. Add the remaining sliced strawberries and honey and stir to combine. Set aside until ready to serve. When you’re ready to serve, carefully slice the shortcakes in half lengthwise with a paring knife. Top the lower halve of each shortcake liberally with sliced strawberries, followed by whipped cream. Top with the upper halve of the shortcake. If you want to make them extra decadent, add one more dollop of whipped cream and maybe a small strawberry on top. Serve immediately. Recipe created with references to the New York Times and King Arthur Flour. 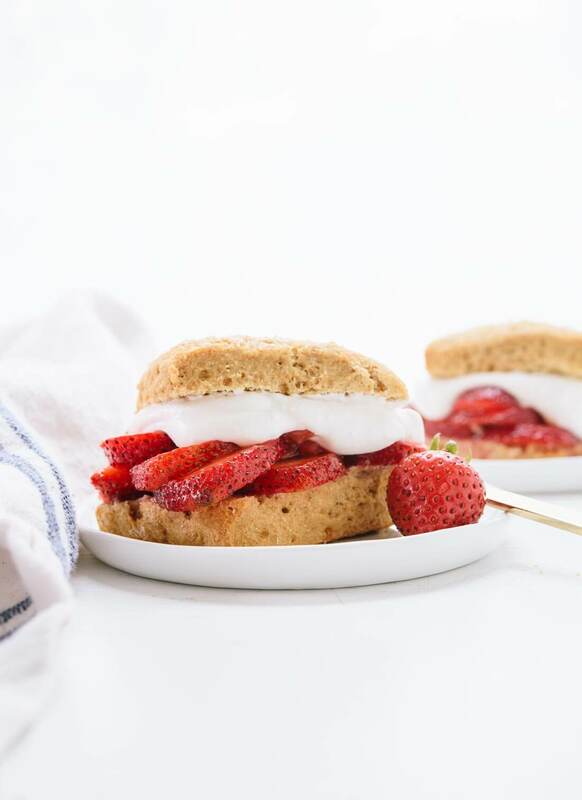 Love the sound of this healthier shortcake!! Also, I hadn’t heard about the BPA thing with coconut milk – YIKES – thanks for sharing! Thanks, Laura! I hope so! It would have been a fun post-cookbook project. Yeah, the BPA thing is scary, eek. Kate, you are awesome! I love your recipes and I love that they are healthy! This looks fantastic! My grandmother’s strawberry shortcake was always so good because she smashed the strawberries instead of slicing them, just like this. Juicy juicy! Does the honey/maple have an additional macerating effect on the strawberries like sugar would? I’ve never tried it. Thanks, Joey! I like your grandmother’s style. Juicy strawberries are best! I can’t quite tell if sugar/honey has the same macerating effect, but they did seem to get more juicy as they sat there. So sorry you missed out on your house, I’m sure there’s an even better one out there waiting! Do you think this would work with spelt flour? Thank you, Kate! I hope so. I think spelt would work, but I haven’t tried it. That must have be so disappointing when you found out about the house! Sorry to hear it. Buying a house is such a roller coaster of emotions. I hope you find another one soon! Wow- I had no idea about the coconut milk. Yikes!!! The recipe looks fantastic. It was! Maybe now if just now the right time. Thank you, Danica. 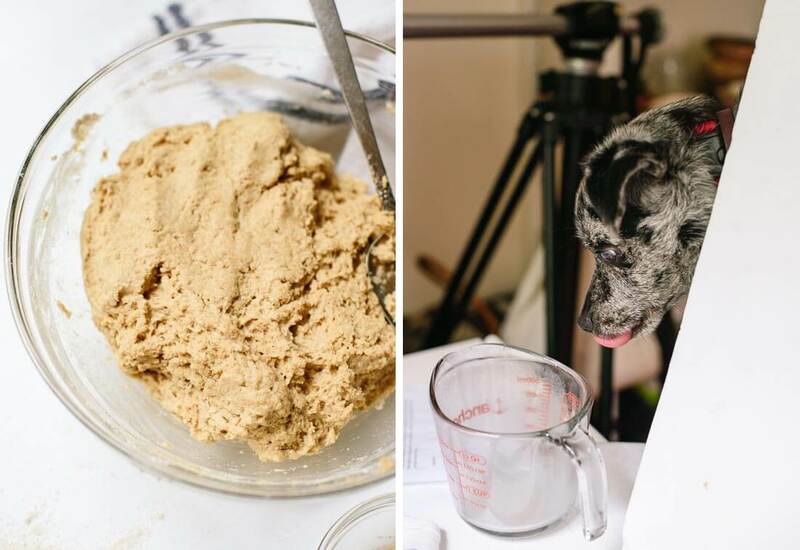 is it possible to use coconut flour or almond meal/flour for this recipe? Hi Patricia, I’m really not sure. That would require quite a bit of tinkering, since both of those flours are unpredictable. I had to re-read your recommendation about buying organic strawberries, “as they are the fruit with the highest pesticide content.” The order of words makes it sound as if the organic strawberries have the highest pesticide content. Took me a bit, but I figured it out. Because strawberries have a high pesticide content, you recommend that we buy organic strawberries instead of non-organic. My boys love strawberry shortcake and I like the simplicity of your recipe. Will be exciting to try it! Also, I am looking forward to your cook book. Please announce when it’ll be available. Oops, I just clarified that statement a little better. Thank you for pointing that out, Rosa. “Please buy organic strawberries, as conventionally grown strawberries are the fruit with the highest pesticide content.” I will definitely make a big announcement when the cookbook is available! Can’t wait for you to see it. I don’t save dessert/baking recipes because I don’t do desserts. That said, I’m saving this recipe because it sounds really good. I like the idea of using coconut milk in place of the shortening (insert picture of my mother cutting in shortening with two knives because she doesn’t believe in pastry blenders). Actually it would just be easier to use coconut milk. I have a total infatuation with coconut whipped cream. I not even dairy free but it’s just that good. Love you healthied up the shortcakes! Thanks for the shortcake recipe. I buy coconut milk found in the refrigerator section. Is this different than canned? No worries – the perfect house awaits you. Thanks, Jan! Yes, that’s a different kind with a much lower fat content. You’ll need to use canned for the shortcake and whipped cream to turn out right. Do you think I could whip the coconut cream by hand or in a blender? Thanks, Kacie! By hand would be challenging, since the cream is so thick at first. You might have luck with a blender, but I’d use pretty low speed settings. One time, I tried it in a blender and it completely disintegrated on me, but I think that might have been because I used a different brand… I wish I remembered for sure! I read your story about the house and felt compelled to write to you. I have been going through almost exactly the same thing for 14 months with a house l fell in love with in Greece. Very disappointing but l’m telling myself that these things happen for a reason. Yiur recipes are always great and you know l always share them on our business page @freshconnectionbrighton. Thank you, Debbie! House hunting has proved to be stressful and disappointing so far. I hope you find just the right place soon. Thank you for sharing my recipes with your followers! Ah, I’m so sorry to hear that the house fell through. I hope something even more charming opens up soon. 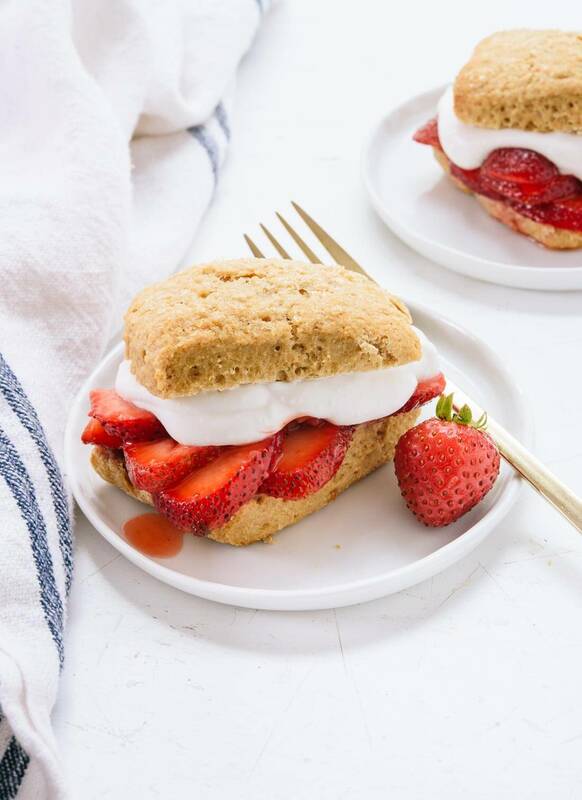 These strawberry shortcakes look excellent, though- I love the use of coconut whipped cream in them. I am sorry to hear about your house, Kate! That sounded beautiful and so charming. I hope it’s not long before your dream house becomes a reality! Thanks for sharing this beautiful recipe. 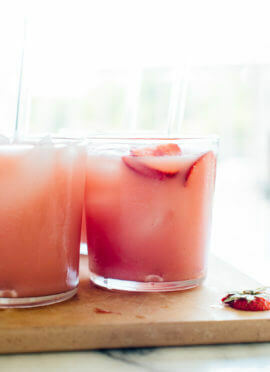 How fun and summery! Hey Janet! Congrats on your engagement. :) I hope to find that dream house soon, thank you! All of your recipes look fantastic! I can’t wait to start trying some of them. I have a question about the shortcakes. I am allergic to coconut and wonder if I could replace it with something else. Hi Cathy, I would try heavy cream or half and half. Thanks – I’ll try that! I am so happy to have this recipe and plan to make it this weekend. A question about the shortcake part: can whole milk or cream be substituted for the coconut milk? Either one might work in the biscuits, I just can’t say for sure! This looks so delicious! Strawberry Shortcake is one of my favorite desserts. Thank you so much, Gayatri! These turned out soooo amazing, Kate! Thank you :) I used whole milk instead of coconut milk and drizzled more honey over the coconut whipped cream and I couldn’t stop eating them! 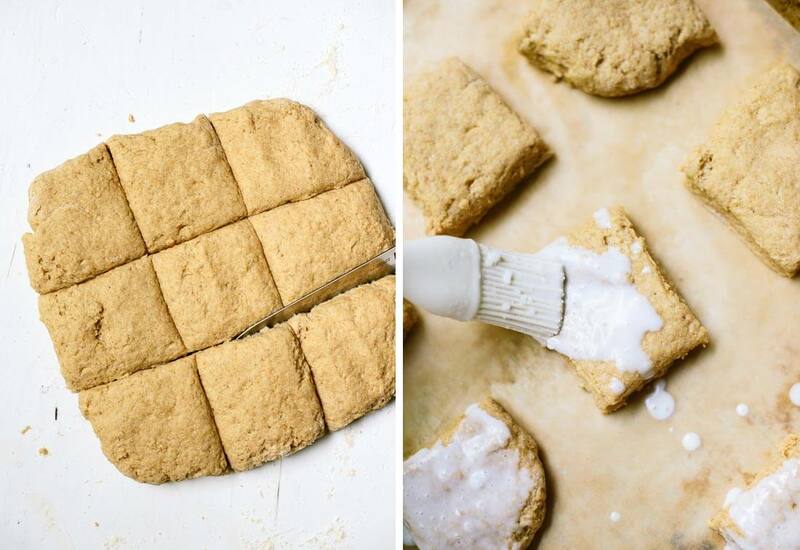 I love working with wholegrains and I’m always tempted to try and up my wholegrain baking game (I’m a cake/ biscuit eater rather than baker) definitely thinking of giving these a try! Let’s hope so! Thank you, James! Oh! In my minds eye I could see you in that house. But I’m certain that either that house will come back to your reach or you’ll find something equally beautiful! I can’t wait to try this receipe! Yum!! This looks amazing. I love your recipes and I have been looking for more desserts that limit sugar. I’m excited to try this! As for the house… your dream house is around the corner, I’m sure. Everyone I know that’s bought a house (myself included) juuuuust missed out on a house they had their heart set on and then ended up with one they loved even more. Keep looking! Thanks, Karolina! I sure hope so! On a positive note: this looks amazing! I’m really not a baker, but I think I can attempt this! Also, thank you very much for the note about the organic strawberries and BPA cans… I had no idea! Very useful info!! Hi Bridget, I’m so sorry to hear about your sister. I hope these turn our great for you and bring back lots of happy memories. Oh no Kate, that is so disappointing. Hopefully that just means there is an even better house waiting just round the corner for you. I too would love a big kitchen. OK, strawberry shortcake all round to cheer us both up! I hope so! Thank you so much, Jacqueline. Yum! Looks like the perfect treat for an end of summer get together! Thank you so much, Evelyn! I am always counting my chickens before they hatch, it seems. :) I am casually looking now; I’m not 100% convinced I should be buying a house now, anyway. Hope you get a chance to try this dessert soon! Oh sad news about the house. :( House hunting can be such an emotionally draining experience. Hopefully this means that there is something even better and more perfect for you out there, right? 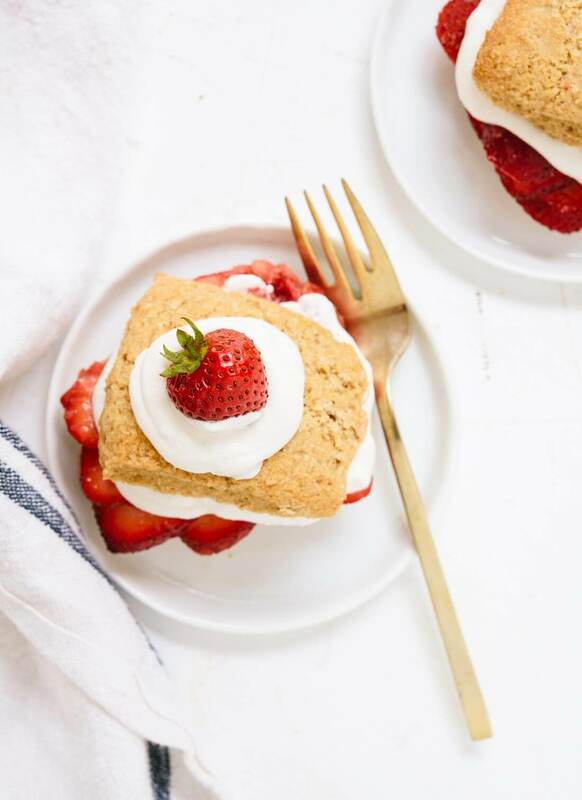 Healthier strawberry shortcake sounds like a wonderful way to finish the summer. Thanks for the tip on the non-BPA coconut milk- did not know that! I hope! Maybe now isn’t the right time to buy a place. Thanks, Emily! Thanks for the recipe, especially noting ththe e BPA of the can liners and high pesticide content of non-organic strawberries. On a par with them are sweet bell peppers, potatoes. I plan on serving this at Camp Biche next spring when our strawwberries are ready but in an even healthier version, and very small portions. I will post photos. Thank you, Craig. Hope your shortcakes are a hit. Thank you from Sydney, Australia for inspiring me to bake healthy…. Your banana bread is so easy and delicious and a staple in my freezer (pre-cut in grease paper) ready for lunchbox treats! Thank you, Michele! I’m glad you are enjoying the banana bread. I am not entirely sure about distribution yet, but I sure hope it will be in Australia! I’m sorry about the house incident! My family is moving as well and we are SO stressed out about finding the “one”. But just know that everything will work out in the end–sometimes it’s better NOT to be too emotionally attached to a house! Anyways, this strawberry shortcake looks to DIE FOR. I love strawberries, and they are the BEST fruit for pastries besides blueberries! I hope you find the perfect home, Cassie! The nice part about looking, for me, is that I’m not in a hurry. Have a great weekend! I’m sorry about the house, Kate. That is so disappointing. I hope you find something else soon. I’m excited to try this shortcake recipe. I’ve never been satisfied with the dairy-free shortcakes I’ve made in the past, but these look so airy and good! Thank you, Kate! I hope you love these. Please let me know how they turn out. Made this last night and from the nibbles I took it is fantastic. I was a little confused about the solid in the coconut milk can, as I had not solids, but I think the milk whipped just fine for me. I’m bringing them to some friends tonight– hopefully they like vegan desserts! Commenting to follow up and say that everyone loved the strawberry shortcake. They were amazed with the ease and taste of the coconut whipped cream, and loved the biscuits. I would make this for anyone– it is fantastic. Hi Kate! I have made many of your recipes and absolutely love them. I tried this recipe and it was delicious. I did have one question, my shortcakes came out slightly more dense than your pictures, any tips to making them light and fluffy? I am going to make this tomorrow – vegan and gluten free! I will let you know how it turns out. I love your recipes! I hope it worked! I tried making these shortcakes with a gluten-free all-purpose blend (Bob’s Red Mill) and they did not cooperate. Hi Patricia! That’s a great idea. I’ll share photos once I’m situated. I’m stuck with my current kitchen for another month, but can’t wait to upgrade! Some Tahitian vanilla beans I got at Slofoodgroup.com. They added a nice floral tone. My daughter loves these for dessert. Thank you! These look so good, they are now on my list of things to try next weekend! Oh, do let me know how it goes! I find these to be the perfect sweet treat. Yes! This is exactly what I was looking for. This is so perfect for Mother’s Day dessert. Your blog is always coming through for me! Yes! So glad you found what you were after, Rachel. I hope Mom loves it! 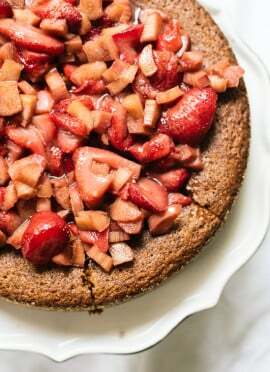 I like the idea of making the cake whole wheat and healthier. But i am not a fan of coconut milk. It’s pretty high in calories and saturated fat, too. My family actually prefers a regular cake over “shortcake” so you can use buttermilk (WAY fewer calories) instead. Reducing the sugar content without affecting the tenderness is a bit of a challenge, though. Maybe you have done it successfully? I know sometimes people use fruit or veg purée…what if you used strawberries in the cake as well….? Hmmm, need to try this. Feel free to experiment, Elisabeth! I hope you can find a version that meets all your needs. hi, what is the total calorie for this dessert? Hi! The nutrition information is below the notes section of the recipe. :) This one is 348 per serving. Hi! I am getting ready to make this recipe :) I read that you really need to use full-fat coconut milk. Well, they only had light at Trader Joes so that’s all I have! Is there a way to still make the recipe work? It’s okay if it’s not vegan… maybe I can add butter or nut milk? Thank you for any advice! Hi my dough was super sticky when I made the mixture and had to add so much flour to make it manageable! I used plain flour instead of wholewheat though, do you think that could have been the reason? They’re just in the oven hope they turn out okay ! Hi Marriyah! Unfortunately, changing the flour will make a difference. How did they turn out? Also another thing, I know they’re meant to be healthy but sometimes the best bit about shortcake is the buttery taste! How could you add butter to the recipe ? Would you substitute the coconut milk and how much? Hi Mariyyah, the butter would replace the coconut oil. If you’re looking for buttery shortcake, you might have better luck following a recipe designed for butter (most shortcakes are). Hope that helps! Let me know what you think, Sunil!